Keith Clemson, a psychotherapist focused on couples therapy in Washington, worries about his dog when he goes away. A chow chow, Ripley looks like a fluffy bear and can be sweet, but he can also be stubborn and a bit mean. If people are splurging on a relaxing resort vacation for themselves this summer, then why not do the same for their dog or cat? 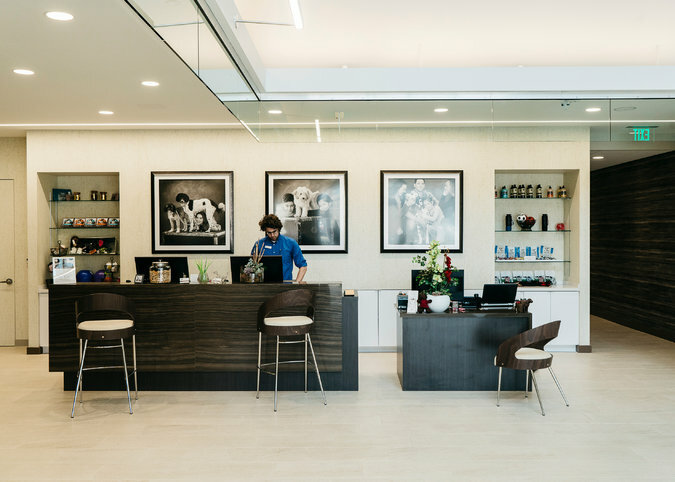 While most people are fine sending Fido or Fifi to the neighborhood kennel, others are choosing high-end pet hotels and spas that aim to match the service and amenities of a Ritz-Carlton or Four Seasons. For the four-legged set, that degree of luxury is very hands — or paws — on. Amenities can be added à la carte. For $40, a dog can have a “water workout and lap swim.” The more strenuous Iron Dog workout — jog, swim and field play — costs $80. A sports massage afterward is $35. Photos for owners are $10, for four pictures. The cost for dogs to be fluffed and powdered varies by their size and weight. But there are extras here, too, like a blueberry facial ($10), mud bath treatment ($30 to $50), “pawicure” ($15, though nail polish is an additional $15) and “ear cleaning and hand-plucking of the hair” ($12). Ms. Sedwick recently opened a third resort in the Washington area to keep up with demand. 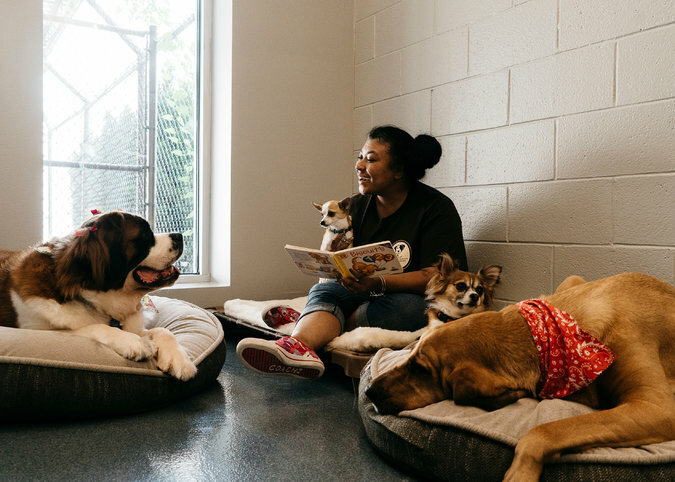 The location, in Rockville, Md., cost $9 million to build, from buying the land to developing the site, and can accommodate about 200 dogs. One of the biggest criteria for these hotels is a high-end air filtration system so there is no smell. All of this may seem a bit much, if not for Americans’ penchant to pamper their pets. Last year, Americans spent nearly $6 billion on pet grooming and boarding, which is separate from the nearly $16 billion they spent on veterinarian care, according to the American Pet Products Association. The trade group projects that the number will grow by some $350 million in 2017. It’s not always about the extra walks, snuggle time and massages. Sometimes it’s a room with a view, a television tuned to Animal Planet and a camera so pet parents can keep tabs on their fur friends. Dog suites range from $70 to $205 a night for the Texas King Suite, which, at 200 square feet, has space for two dogs and is equipped with a webcam, cable television and a nice window. “The irony is it’s little dogs staying in there,” Ms. Grimes said. 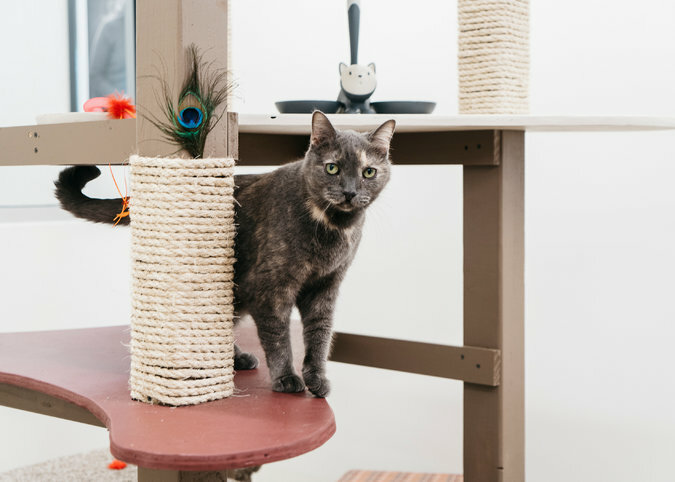 All of the cat suites have a skylight — “because cats get their energy from the sun,” she said. The rooms are $65 a night. If the cats are skittish, Ms. Grimes has freeze-dried salmon to relax them. Amy Jo Birkenes, the owner and manager of Chateau Poochie in Pompano Beach, Fla., has themed rooms for pets. The Royal Tea Suite, for example, has a chandelier and calming blue walls, with sturdy furniture for a dog to sleep on. It costs $199 a night for 225 square feet. “I have clients from Europe who come in and book that suite,” she said. Chateau Poochie is more like an activity-packed all-inclusive resort. 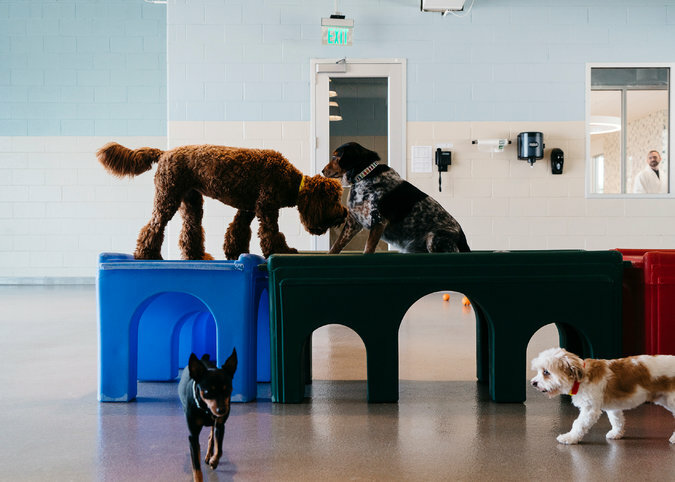 The dogs get up at 6:30 a.m., go outside, eat breakfast and by 7:30 a.m. are in the “social lounge,” where they play until lunch. Then all the dogs take a two-hour nap. They’re back out in the afternoon for more supervised activities, often starting in the fitness center. After dinner, the dogs are given rubber chew toys stuffed with peanut butter. “I call it the doggy martini,” Ms. Birkenes said. If a dog still has trouble sleeping, she said, a staff member will sleep next to it — for about $200 a night. These amenities have appeal. Tommy McFly, a radio host in Washington, said he specifically requests a suite with a web camera when he and his husband board their dogs, Chip and Mr. Troy, at Olde Towne Pet Resort. He misses them and likes to see what they’re doing. When he got married, he wanted to get extra treats for the dogs. This included time in the pool, but also some dental work. “I vacation a lot more relaxed when I know the dogs are being taken care of,” he said. There are, of course, people who would not deign to leave their dog at even a flea-free resort. They bring the caretakers to their dogs, ratcheting up the care in their own homes when they go on vacation. Or in some cases, they fly with them. Edward Alava, the owner of the Dog Store, a dog spa with locations in Midtown Manhattan and the Hamptons, said he often gets called to prepare dogs for trips. He said the cost starts at $350 and runs as high as $1,500 for flight prep. He said the cost rises with extras like chauffeuring the dog to the airport or, in one case, getting a helicopter to fly it to the Hamptons. “Like us, after a nice massage, we can take on anything much easier,” he said. In the summer, he runs a program in the Hamptons akin to what people get when they spend time at their weekend home. Starting at $250 a day, he takes a dog for walks on the beach at sunrise and sunset; in between he allows the dog to relax with spa treatments and pool time. When it comes to Ripley’s trips to the Olde Towne Pet Resort, Dr. Clemson said he turned his nose up at the pet pedicure and the spa experience in general. Too excessive, he said. Nothing less than what anyone would want to hear about a child, human or canine.